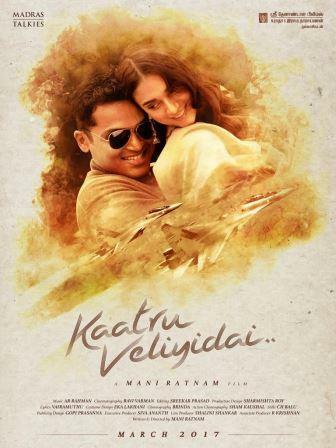 Kaatru Veliyidai is an upcoming Indian Tamil-language romance film written, produced and directed by Mani Ratnam. Featuring Karthi and Aditi Rao Hydari in the lead roles, the film has music composed by A. R. Rahman and cinematography by Ravi Read More.. Description Kaatru Veliyidai is an upcoming Indian Tamil-language romance film written, produced and directed by Mani Ratnam. Featuring Karthi and Aditi Rao Hydari in the lead roles, the film has music composed by A. R. Rahman and cinematography by Ravi Varman. Principal photography of the film commenced on 8 July 2016 in Ooty. The film will be dubbed in Telugu language titled "Duet" and will be released in March 2017. Kaatru Veliyidai is an upcoming Indian Tamil-language romance film written, produced and directed by Mani Ratnam. Featuring Karthi and Aditi Rao Hydari in the lead roles, the film has music composed by A. R. Rahman and cinematography by Ravi Varman. Principal photography of the film commenced on 8 July 2016 in Ooty. The film will be dubbed in Telugu language titled "Duet" and will be released in March 2017. No reviews available for #KaatruVeliyidai, Do you know Kaatru Veliyidai?, Please add your review and spread the good things. I love this movie. The camera and the direction was awesome.